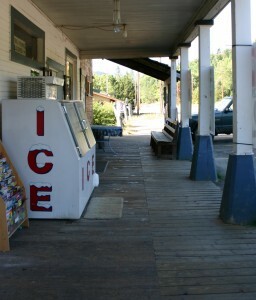 Post Office Boxes at Azalea General Store, Azalea, Douglas County, Oregon. 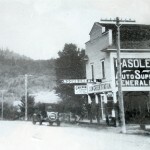 This is the same image that was used for our latest issue of the Umpqua Trapper. Well, the lastest edition of the Umpqua Trapper is at the printer. 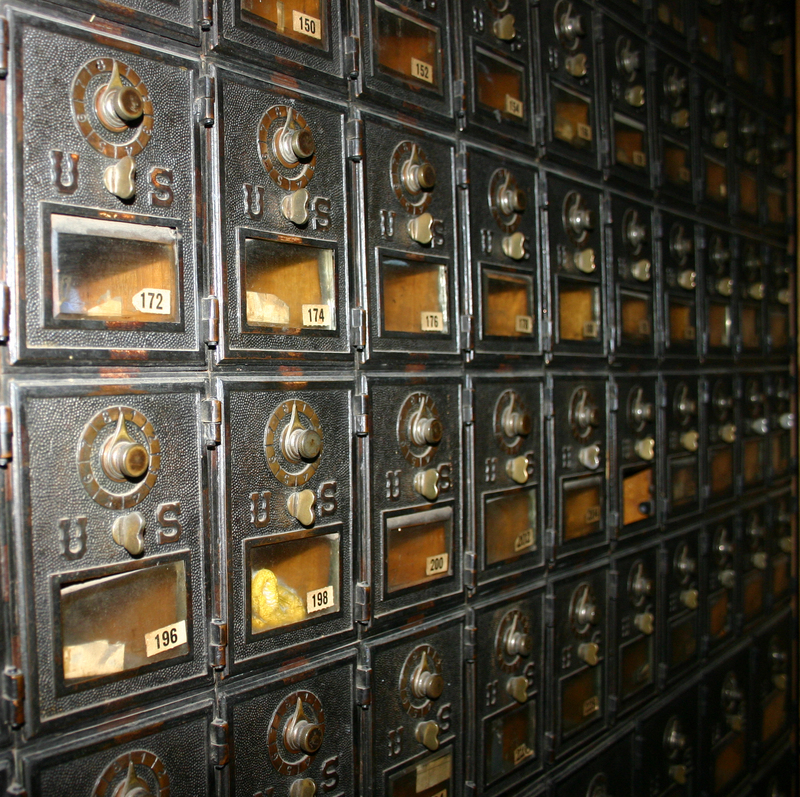 It is part two of our last edition which explored post offices that no longer exist. While researching it, I (Peggy, one of the editors, and webmaster here) remembered seeing old time p.o. boxes at a general store in Azalea. So I drove down there to see if the folks there would let me take a photo. The lady there very kindly, let me take a lot of photos. Azalea, of course, still has a post office. 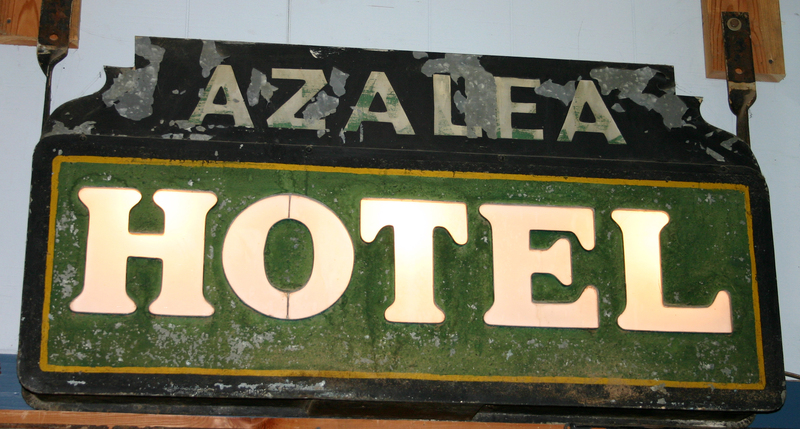 But, Azalea was also once called Booth, and Starvout. Neither of those two exist. With this knowledge, I justified my trip to Azalea! It is an amazing journey, you step back into time the moment you leave your vehicle and step onto the general store’s wooden sidewalks. Open the door to look in the walls and shelves are lined with antiques. There is even an old gas pump in there! 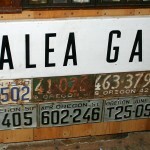 Old photos, old signs, license plates, and yes, post office memorabilia! It’s a trip, you’ll never forget. So, if you are driving down I-5 and going through Azalea think about stopping in and saying hi! Let them know that you read about them here. Give them a little business because without their permission these photos simply would not be here. They were very generous! On the rest of this post you’ll find more photos I took along with any information that I could dig up on any of what I saw there. 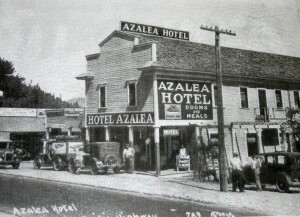 Azalea Hotel. 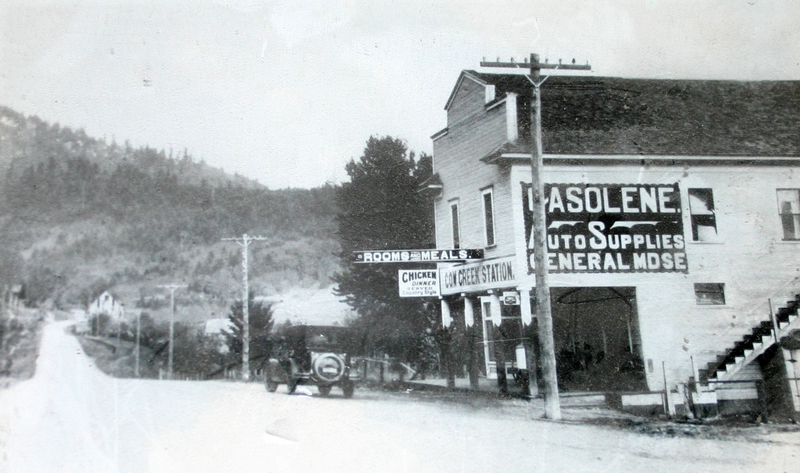 A photo of a photo that resides inside the general store today. The lady at the Azalea General Store let me take pictures of pictures. 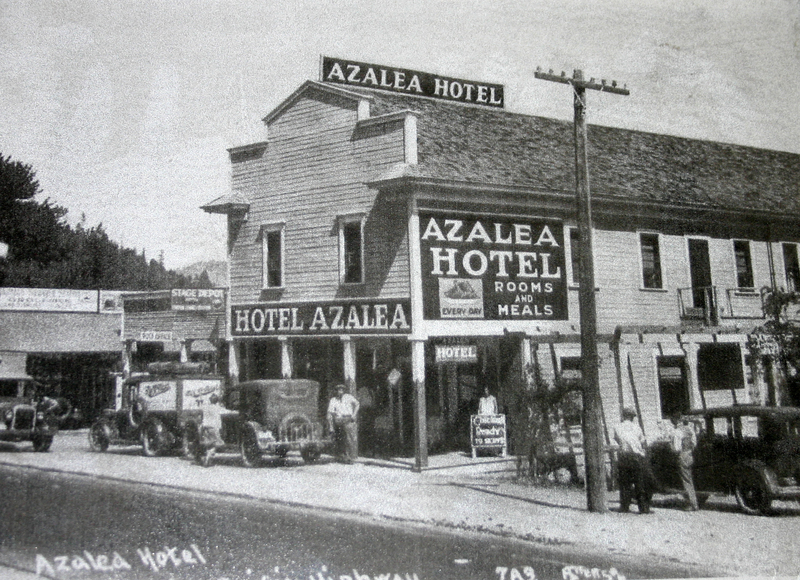 You’ll see that this building was also known as Azalea Hotel, Cow Creek Cafe, Cow Creek Pass, etc. She did not know the time frame of just when the p.o. boxes were used but she said they were the originals that came with the building and she even showed me the window where people could ask for their mail, pay postage, etc. While peeking around I noticed that there were still folks names on the backs of the boxes. An original (and still lights up!) 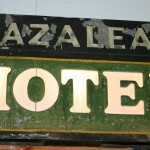 Azalea Hotel sign! 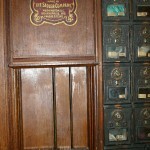 The backs of the old time post office boxes. 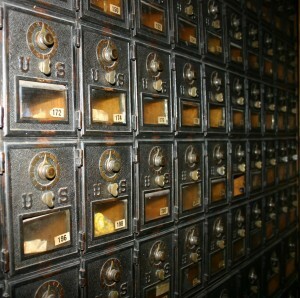 Where folks names are still there to identify their mailbox for the post office employee as they sort the mail. The window where people picked up their mail, and paid their postage or sent off their packages. It is closed today. 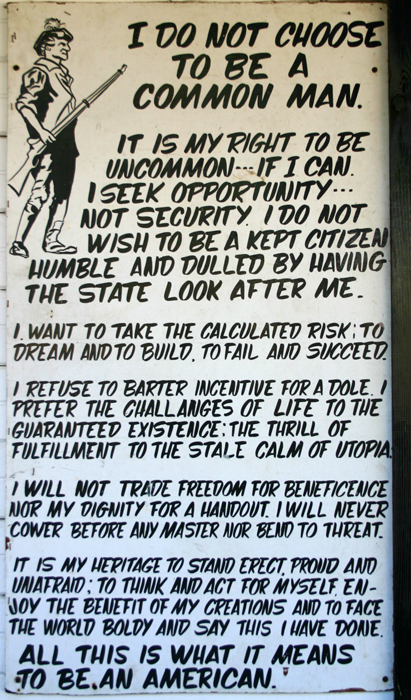 A sign outside of the general store in Azalea, that reminds us who we are as Americans. 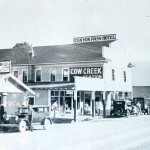 An interesting piece of Americana that still exists in rural Oregon today! 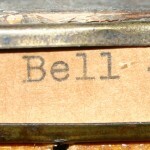 One of the names still on the back of the post office boxes in the Azalea General store. 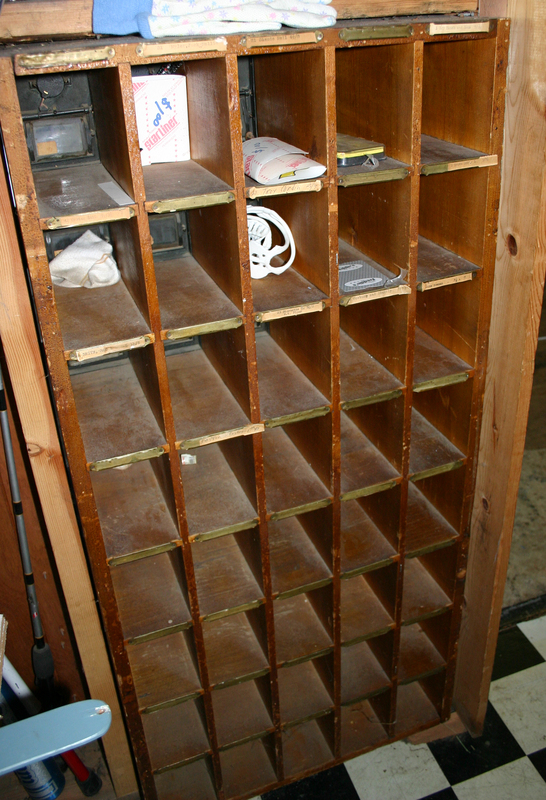 Some of the names still on the back of the post office boxes in the Azalea General store. 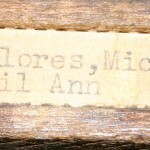 A family of the names still on the back of the post office boxes in the Azalea General store. All Photos © Peggy A. Rowe-Snyder. All Rights Reserved. 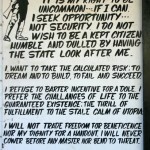 This entry was posted in Newsletter, Photos, Selected Histories, The Umpqua Trapper. Bookmark the permalink. 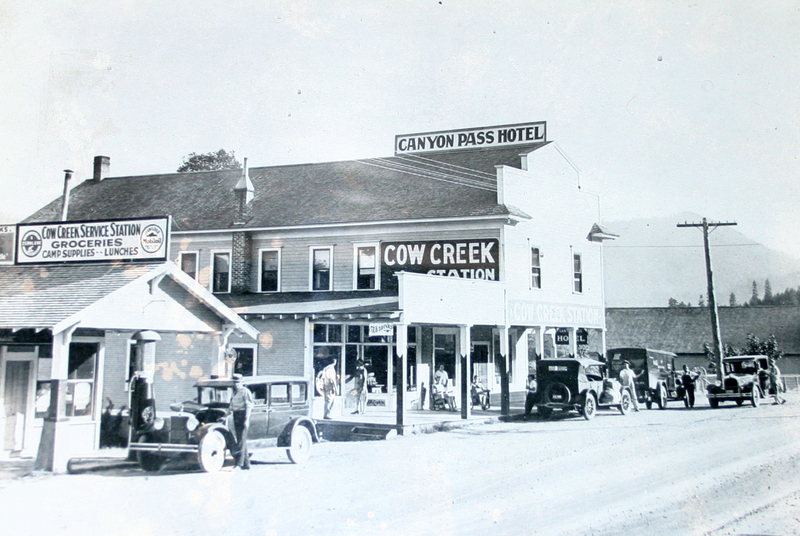 Excellent piece of Southern Oregon history. I will definitely need to make a trip through Azalea. Thanks for posting. Very interesting. I must include this on my next scouting mission. My great Uncle ( X ? removed) was A.L. Todd, an early pioneer circuit preacher, that included most of these communities as part of his parsonage. As soon as the roads clear, I’ll be there from East of Diamond Lake! 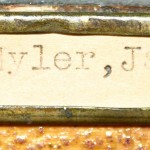 Jack and Nellie Myler were my grandparents. Loved seeing their mailbox! 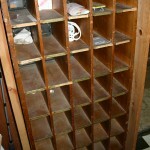 I am so happy that you found the photo of your grandparent’s mailbox. 🙂 You can right click over the photo to save it to your computer. 🙂 If you put it some place like Ancestry, please just give me the credit for the photography. I love sharing history!!! Come see us at the Floed-Lane house if you are ever through!!! 🙂 Peggy Rowe-Snyder, President, Editor of the Trapper, DCHS.